Sciency Thoughts: Cladolasma ailaoshan: A new species of Harvestman from Yunnan Province, China. 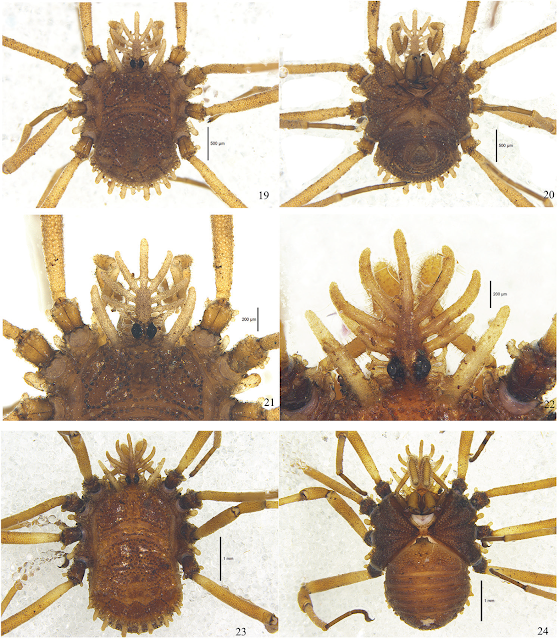 Cladolasma ailaoshan: A new species of Harvestman from Yunnan Province, China. Harvestmen, Opiliones, are carnivorous Arachnids resembling Spiders, though they are not closely related and are incapable of producing silk. 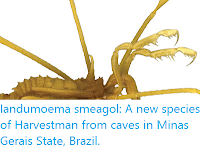 The Family Nemastomatidae comprises around 170 described species of small Harvestmen, reaching a maximum of about 6 mm. The family is divided into two subfamilies, the Ortholasmatinae, which is found in North America and East Asia, and the Nemastomatinae, found in Europe, North Africa and the Middle East. 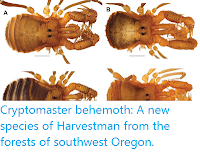 In a paper published in the journal ZooKeys on 4 April 2018, Feng Zhang, Likun Zhao and Chao Zhang of The Key Laboratory of Invertebrate Systematics and Application at Hebei University, describe a new species of Ortholasmatine Harvestman from Yunnan Province in China. The new species is placed in the genus Cladolasma, which contains previously described species from China, Thailand and Japan, and given the specific name ailaoshan, in reference to the Ailaoshan Natural Reserve in Zhenyuan County, where the species was discovered. 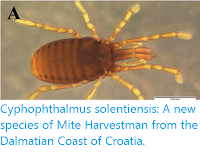 These Hervestmen are heavily sclerotized (have hardened skins) yellowish brown in colour, with females larger than the males, reaching 4.6 mm, compared to 2.8 mm. Cladolasma ailaoshan. Photographs of male and female. (19) Body and parts of appendages, male, dorsal view. (20) Male ventral view. (21) Hood, male, dorsal view. (22) Hood, female, dorsal view. (23) Body and parts of appendages, female, dorsal view (24) Female ventral view. Scale bars: 1 mm (23)–(24); 0.5 mm (19)–(20); 0.2 mm (21)–(22). Zhang et al. (2018).